Will AI's Replace the Media? A better way to cover mass-shooting? Focus on tomorrow! I have been trying not to discuss the question of whether AIs will replace journalism, because it's such a contentious topic. But I have been getting a lot of questions about it. So, in this article, we are going to take a deep dive into why many forms of journalism will be replaced by AIs, and what that means for our future. Data that looks like it means something, but doesn't. We have seen all the stories about inaccurate use of data from Google and Facebook when they have been selling advertising to brands. And while that certainly needs to be fixed, we in the media actually have just as big of a challenge ourselves. In the media, we still try to sell advertising to brands using the tactic of "I have no idea if it's going to work. You pay your money, you take your chances", as described by Mel Karmazin when he was the president of Viacom. But if we want to stay competitive, we need to step up our game... And in this article, I illustrate five reasons why. Gerry McGovern wrote an interesting article about the disconnect between what people want, and what a local city council published. "When we got the citizens of Liverpool to vote on what they wanted from Liverpool City Council, we found top tasks such as libraries, leisure facilities, roads, waste collection. 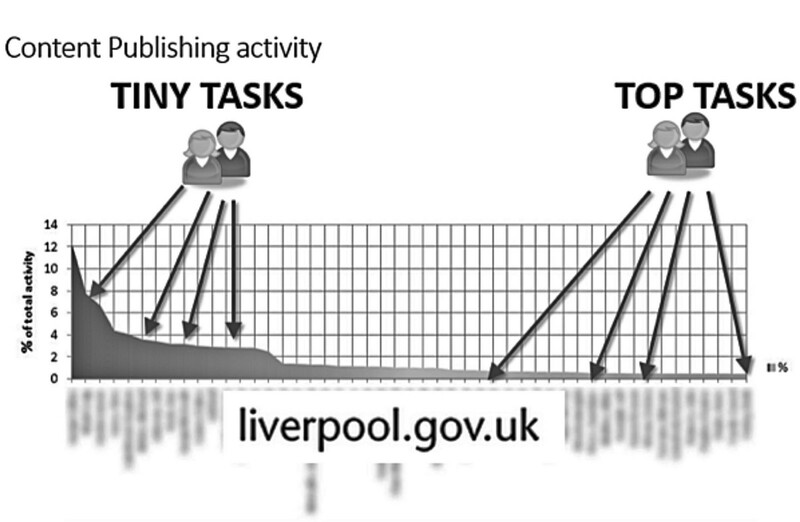 When we analyzed the relationship between publishing activities for the council on its website and citizens' top tasks, we found an inverse relationship. The more important the task was to the citizen, the less was being published on it, the less important it was to the citizen, the more that was being published on it." This study is in itself very interesting, but I'm pretty sure the same applies to what people will find in the media. When readers turn to their local newspaper, in this case the Liverpool Echo, are they going to see stories about things that matter to them? Or are they going to see more stories about other things? Mass shooting in Las Vegas leaves 50 dead and more than 200 injured as police name suspected shooter. Violet Grace's parents describe moment she was born in heartbreaking birthday tribute. Las Vegas shooting leaves St Helens tourists fleeing for lives after gunman killed more than 20. Good Morning Britain interview cut off as panic erupts during a hotel lockdown. Monarch Airlines cease trading: 110,000 customers stuck abroad and 330,000 flights cancelled. North West to be battered by gale force winds. Merseyrail given London Underground makeover in ambitious new blueprint. Secret trick which gives you access to the best playlist on Spotify. Sure, the mass shooting in the US is a big story, but why is a local newspaper like the Liverpool Echo covering it as if it was local news? Obviously, I'm not trying to pick on Liverpool Echo because this is a general problem. So ask yourself this: If you were to do a study like the one Gerry McGovern did for the local council, what do your readers want compared to what are you publishing? And then ask the question: Why is it so hard for us to get people to subscribe? Journalist: Instead of sending journalists to Vegas to cover an endless stream of eyewitness reports, focus on Washington ask the public as a whole what should be done to fix this. What happened today isn't the real story here. It's what will (or won't) happen tomorrow. Also, reach out to the influencers, the business leaders, the school professors, those others look up to, and ask them about this. What do they have to say? Right now the media is covering Vegas as a reality TV show. Lots of eyewitness stuff, rumors, etc... and then tomorrow it will be mostly forgotten. Let's change that. Let's make journalism mean something! I'm not saying journalists should 'take sides'. I mean, be a part of the solution (regardless of what that solution should be) instead of just yet another short term news boost. During and after the hurricane Harvey, we saw local news sites like the Texas Tribune focus on creating 'community journalism that helped people (rather than just report eyewitness reports). It was incredibly valuable. The same could be done here! One of the dilemmas we often see in the media industry isn't that people don't know that things are changing or that they need to do something about it. Nor is the problem that the people at the top don't see this. We see this in a recent study by WAN-IFRA. They asked: "What is the single most important risk to your news organizations' future success?" ... and the answer was overwhelmingly "Reluctance to innovate" (followed by the struggle to find new business models). In other words, the people at the top very much know how things look, but real change is hard to do. The problem is often a combination of three things. First, there is a massive problem within most media companies around the culture of the organization, often in the way that 'change' is seen as a negative rather than something everyone is constantly trying to do. So when innovation is discussed in media companies, it's often as a separate project, rather than a day-to-day activity. Secondly, the fear of losing what you already have is often higher than the fear of not preparing for the future. This is despite the fact that we can see a very clear trend towards the latter. And the result is inaction. Thirdly, there is general confusion about what to do. As you can see, the challenge of finding a 'new business model' is the second largest challenge. But the problem here is also that many of the new business models (of which there are many) redefine the old models (which leads back to point #2). All in all, this all points to the fact that the media industry has become incredibly risk-adverse, whereas the tech industry embraces risk. Think about how many things Facebook and Google has tried and failed at over the past five years.